My review of the new SCX Digital wireless system. I am sure that many people are aware of the new wireless system now for sale by Slot Car Solutions. I finally had a chance to take the system for a drive, and I thought I might share my thoughts. Sometimes aftermarket equipment can be somewhat less than what you wanted, I think that the new wireless interface falls closer to the other end of the scale. The system looks very clean and professional in design. This may be due to the fact the team at SCS has designed a similar system for a different brand. The system works via transmitters and a receiver. The receiver plugs directly into the existing hand control jacks on your SCX control units. It is a solid state unit, with no moving parts. It is not an infra-red system, so it can be easily used in bright, dim, or any other light condition. It is also easily affixed to a table leg, to keep it off and away from the racing surface and safely protected from accidents. The other part of the system is its transmitters. Each driver will need his own transmitter with this system. Standard SCX hand controls plug right into the transmitter with no problem. It seems as though aftermarket controls are likely to work without any issues, including the Slot.it control with a work around. The transmitters are about the size of a garage door opener, or slightly larger than a deck of playing cards. The version I used also came equipped with a belt clip. I tried the unit both ways with great success, so I would suggest that anyone who purchases the system do so with the belt clip upgrade. The extra versatility makes a difference, especially if someone is wearing an outfit with no pockets like my wife often does. Overall the system ran great, but it was not perfect. In the beginning we thought we had an issue with one of the transmitters. It was actually a bad brand new battery. After removing the faulty battery and replacing it with a second new battery, everything worked. The only real issue we experienced is a known issue with this item. It seems that whenever a transmitter passes too close to the receiver, some strange behavior is experienced by driver’s that are currently racing. The easiest way around this is not place any transmitter right next to the receiver, keeping them more than two feet apart. The flexibility of the system allows for convenient placement to easily avoid this issue. Its flexibility also allows the use of stock wired hand controls to be mixed and used with the system, for example by having three wireless drivers and three wired. In conclusion, I believe the Slot Car Solutions SCX Digital wireless system delivers everything it promises to. It is well built and adaptable. It does have drawbacks, including the high price, but it certainly increases the fun of racing. I do understand that the price is high due to economies of scale, meaning if sales are good the price could come down. With the relatively small size of the market, I believe the price will likely stay where it is, and I agree with the price asked. I myself give the Slot Car Solutions SCX Digital wireless system four stars out of five. That's the second good review that I have seen. Being tethered with a short cord to a control base limits the experience,I'm tired of waiting on SCX to market this! So I'll take the plunge! Thx to all who have provided info on this wireless system. SCX-D Wireless from SCS a Definite Winner! I, too, recommend this system to anyone who can use it frequently enough to justify the cost. I purchased the 6 transmitter system with belt clips and a single 6 channel receiver unit. The gentleman from SCS was very helpful and kept me up to date as to the status of my order. I believe these systems are custom made for each order. After I submitted my order, SCS, gave me an approximate date as to when my system would be completed. Once my system was tested and ready to ship, they sent me a PayPal invoice to pay. Once the system shipped (From Sweden to the United States) I received it in about 7 days. In total, from the time I ordered my system to the time I received my system was 40 days. I received my system on June 30. Since then, my friends and I have used 5 of the transmitters over multiple sessions totaling roughly 12-13 hours. As of this post, I do not yet know how long a single battery will last. However, each transmitter has only needed a single 9V battery so far. I am using Energizer Maxx Alkaline 9V batteries. SCS recommends Lithium batteries which should last longer than what I am using but they are also more expensive. As Ahab mentioned, there can be some interference if a transmitter gets too close to the receiving unit. However, as with any 2.4 GHz wireless system, this is always possible. In the owner's manual, SCS warns that transmitters should be kept away from the receiver by at least 1 meter. In my opinion, this is a non-issue since the problem is not unique to this system but a limitation of the technology used. But keep this in mind should you notice any bizarre behavior. The range of use is listed as 10 meters. My layout is 8' x 24' with about 3 feet of walkway surrounding the track. We were able to stand anywhere in my basement and use the controllers. The new trick is to learn to drive while walking around. The belt clips cost extra but, in my opinion, are an indispensable option. Before I purchased the system, I was worried that there may be a slight delay in throttle response between the transmitter and the receiver. However, after using the system for so many hours, I can report that there is no noticeable lag or delay. Our lap times and car responsiveness while using the wireless interface appeared to be similar to when we used the wired hand throttles. While using the wireless system with multiple racers is convenient, it is also a valuable tool for racing solo. With my layout's size, it was time consuming to fix my car whenever I de-slotted because I'd have to walk over to the car, re-slot it and then walk back to the hand throttle. Now I can walk over to the car, re-slot and race from there. Also, the system can be used to race 'ghost cars'. Each transmitter can be configured to run a car at a predetermined, constant, speed. This feature has limitations, though. For instance, the 'ghost car' will either never change lanes or it will change at every crossover. Also, unlike a safety car, the 'ghost car' will be always moving and can run out of gas. While this feature is limited, I don't consider it as part of the reason for buying anyway. I consider it as more of an added bonus. Another feature the system has is what I call 'variable junior mode'. As you may know, the SCX digital systems have the option to lower the maximum speed that cars can move - presumably for novice drivers and children. The wireless transmitters add the ability to set variable maximum speeds for each driver. Want to give a novice adult driver a maximum speed higher than a five year old while both are driving with lower max speeds overall? No problem with this system! One final thing to mention about the receiver: it does not plug directly into a wall outlet! Instead, it has a USB cable to power it. I assume this is to facilitate the wide range of international power outlets. But it's a plus in my opinion. You can plug it into a nearby computer. Some power strips even have USB power outlets built into them nowadays. Personally, I had an extra AC to USB adapter block from on old iPhone lying around that works great. I have it and my three AC power packs for SCX-D plugged into a single power strip so that I can turn everything on or off simultaneously with a single switch. Bottom line - if you race often enough and can afford it, I highly recommend getting the wireless system for SCX-D from Slot Car Solutions! Last edited by SuperHomer; 07-06-2013, 02:27 AM. Yes as I said originally the system works GREAT...exactly as described above! I have never had any problems with it what so ever and for RANGE well my setup is in the basement and I went outside on the driveway ....pulled the trigger...went downstairs and the car had sped down the straight away where I left it and fell off on the corner! SCS Track call and adruino support upgrade. Just wanted to send out a quick message to let everyone know there has been an upgrade done by SCS that includes a track call button on each tx box. Button allows racers to generate a track call (all cars run at 50% max) or track kill. In addtion they have built in conectivity to adriuno, which will allow us to comunicate with PC lap counter. I finally recived my complete set (including the truespeed controllers), and have just hooked everything up (except the adriuno comunication part), and must say it sure calms things down when you can kill all the cars from any unit. THe SCS wireless system is working flawlessly and the kids are having more fun racing than playing on moms ipod! When I get a little more time (work keeps getting in the way) I will set-up the adriuno comunication to pclap counter and send updates. May you please provide more info about this upgrade?. I guess that this requires a HW update for the current SCS users. Have you bought a new set or sent yours to SCS to perform the upgrade? I bought it new from them after months of emails back and forth as they worked it out. I think I have the original proto type, but it works fine as is. However I still need to get it talking with PC Lap counter but that will only make things even better! I am not sure if they can do upgrades, but it doesnt hurt to ask them. The bad news is I am working too much so I cant work on it as much as i would like, I tried to upload a photo hope that works....and if you have any addtional questions let me know i will do my best to answer them or get the answer straight from my friends at SCS. I will try to get some more photos and upload them soon. Beerzman was right wireless is the best! And SCS make a super product to get the job done. Nice to see that there some interest in our SCX system. Just to clarify, the Track Call function is an Option to the Wireless system and not included as standard. It is possible to update already delivered system with this option but it has to be done in house with us. The price for this is not clear for the moment but send us an email if you are interested. Thanks to all you guys with your reviews , I ordered the scs wireless 6 channel system . It's ready for shipping so next weeks race could be wireless... I can not say how thrilled I am ... It's like santa 's coming late this year !! I think our race is ready to hit another level . I do not have a permanent layout , so each month we build it in the livingroom on the floor. Now without the wires , things could get intresting... 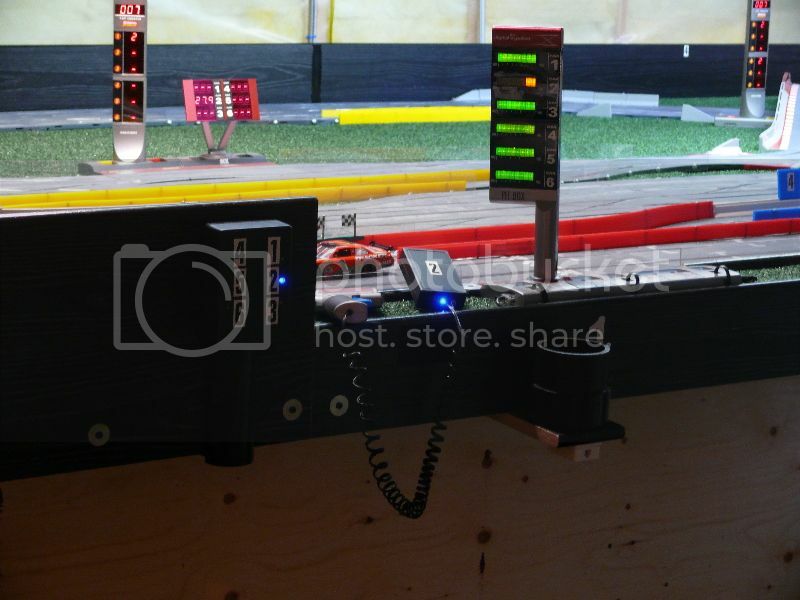 When a car get's deslotted , we held on to the controllers as long as we could ( on a 7 meter track , it's not allways possible ) to get it back on track and of course the wires did get in the way for other cars. All the guys were enthousiast about the wireless system. Hopefully you make a scx truspeed wireless transmitter , and hopefully it can be integrated in the existing configuration. We have a 6 channel system and less cables hanging around .